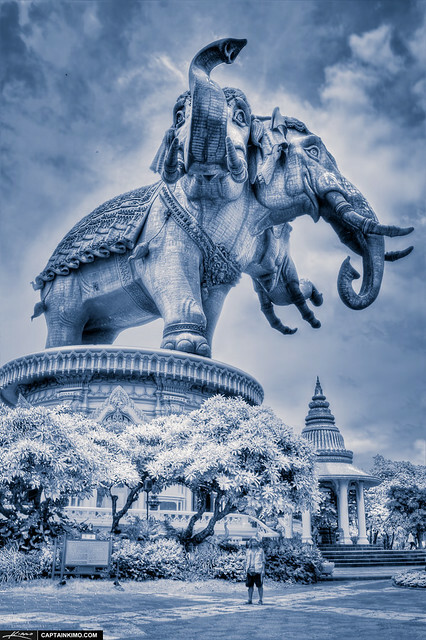 The Erawan Museum on the outskirts of Bangkok in Thailand, in the shape of a 3 headed elephant, is an awe-inspiring ginormous hollow statue standing upon an equally large hollow pedestal. 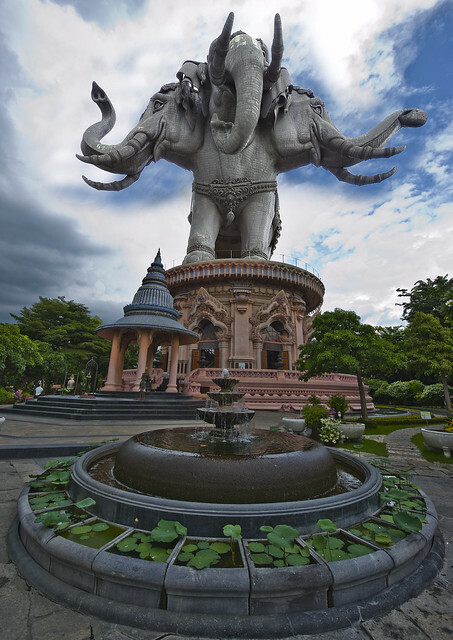 The gigantic three headed elephant made of bronze weighs 250 tons, is 29 metres (95 ft.) tall, 39 metres (128 ft.) long and stands on a 15 meter (49 ft.) high pedestal. In comparison Lucy the Elephant which is often billed as the World’s biggest elephant is merely 19.7 metres (65 feet) tall and 18.3 metres (60 feet) long. The interior of the museum is modelled after the Hindu/Buddhist mythological representation of the universe; the Underworld, Earth and Heaven. The museum has three floors; two floors representing the Underworld and the Earth are located inside the pedestal and the uppermost third floor representing the Heaven is located within the belly of the giant elephant. 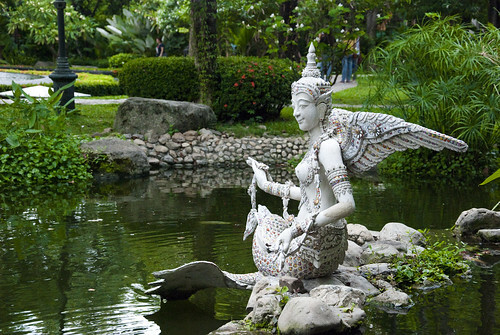 Built by is late business tycoon Lek Viriyapant with the aim to create a space for his vast collection of Asian antiquities and to preserve them for posterity. 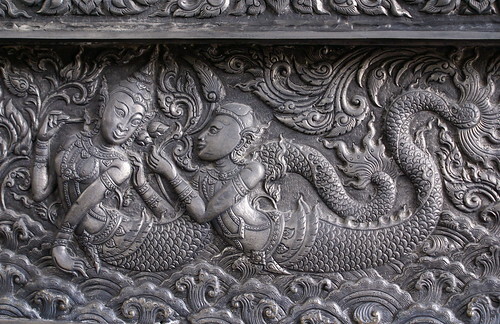 It is worthwhile to note that the entire structure is a museum and not a temple but its interior is heavily decorated with Buddhist-Hindu iconography and designs. The first floor representing the Underworld contains famous Thai painted porcelains Chinese vases from the Ming and Qinq dynasties, Chakri dynasty tea sets, jade ornaments, Chinese furniture and Vietnamese vases. It also showcases the history of the museum's construction by means of photographs and wall placards. The second floor symbolizes the Earth is topped with a big dome made of crystal glass depicting World map, stars and Zodiac Signs. This level also represents Mount Meru (Mount Kailsah), the Axis Mundi of the Hindu-Buddhist cosmology. It houses more precious antiques and arts including ceramics and European pottery. At its centre piece, it has a statue of Bodhisatva Guanyin - the Chinese Goddess with a thousand arms. 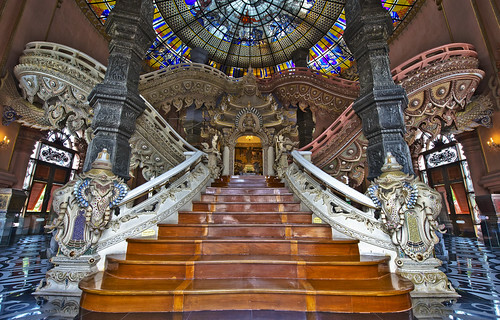 The walls and winding staircases at this level are richly decorated with diverse iconography and artistic gusto which includes hand-beaten copper work, Thai painted porcelains inlays, intricate relief work tableaus, and mural paintings. The top (third) floor in the belly of the mammoth, represents the Heaven, which is believed to be located on top of Mount Meru in Buddhist cosmology. This floor contains relics of the Buddha and old Buddha statues in various postures from several eras including a walking Buddha. 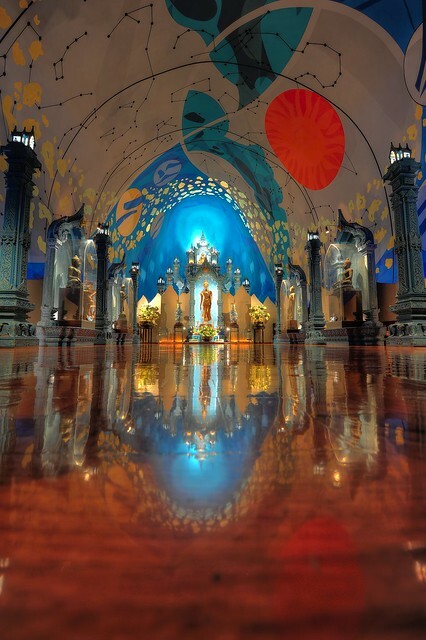 The walls are decorated with paintings depicting the cosmos. It also contains a Dali painting. 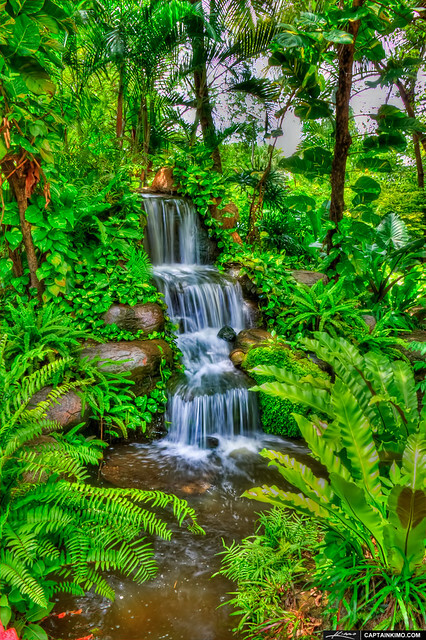 The Museum also has beautiful and lush tropical gardens with some rare flora, beautiful benches, sculptures, pavilions, rock ponds, mini waterfalls etc. 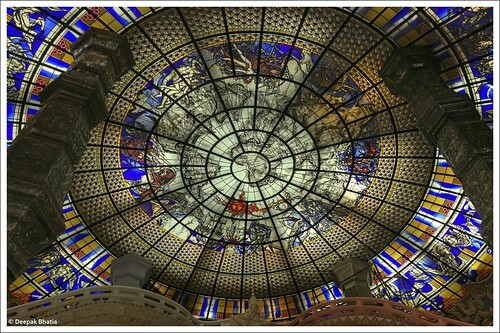 Cosmos - The Stained glass ceiling depicting world map and zodiac signs, designed by German artist Jacob Schwarzkopf.